We have added a webcam to our brewhouse, and after earning a undergraduate degree in this kind of thing, it is now live. While there is nothing to see this weekend, and the feed needs a little refinement, we are now able to broadcast live the process of starting a brewery. We hope that in combination with this blog, and the other information we have put into the world, we will encourage many others to follow their dream and start a craft brewery. It is a labour of love, but something that you will never regret IMO. Anyhow, we will be sure to post a schedule of when things are happening, so that you can watch the process of starting a brewery from the comforts of your own home. Click here for the link and I promise that within a couple days the feed will be more clear. For now, the camera is pointing to the South half of our warehouse, but as things happen it will shift back and forth between both areas, so you can see everything that is going on. This entry was posted in Brewhouse, Marketing and tagged BC, brewery webcam, budget for brewery, Craft beer, East Vancouver, Growler Fills, How to start a Craft Brewery, Im Starting A Craft Brewery, IT, new breweries in Vancouver, Strange Fellows Brewing, Tasting Room, the process, Vancouver on April 26, 2014 by locuswest. Some of you may have come across a story written by Greg Clow of Canadian Beer News. If you live in Canada and you are serious about beer, you should be checking his website on a regular basis. Click here to link with our story and Canadian Beer News. 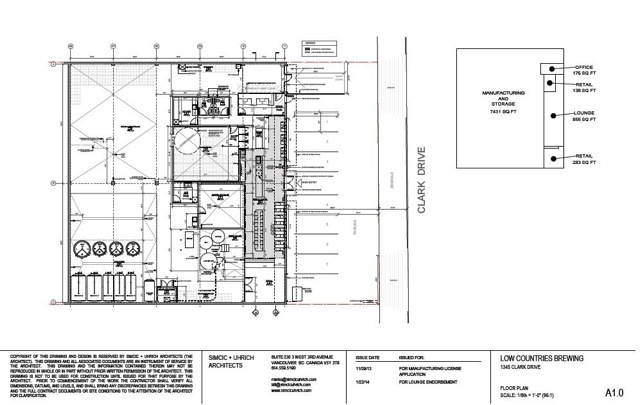 His article focused on Strange Fellows operations and what our full floor plan will look like when complete. I have included both the layout we have moved forward with as well as the side profile of the space, so you can get a sense of the way our operations will look. Not unlike anything else we put out there, things will change somewhat as we move ahead; however, 90% of what is on paper here will be represented in our build-out at the space. Once you commit to submitting building, electrical and mechanical permits, you are also committing to what you have on paper. So in other words, the size of a window in our tasting room that overlooks the brew house may get bigger, but we have committed the location for the bathrooms, the trade waster interceptor and the trenches. 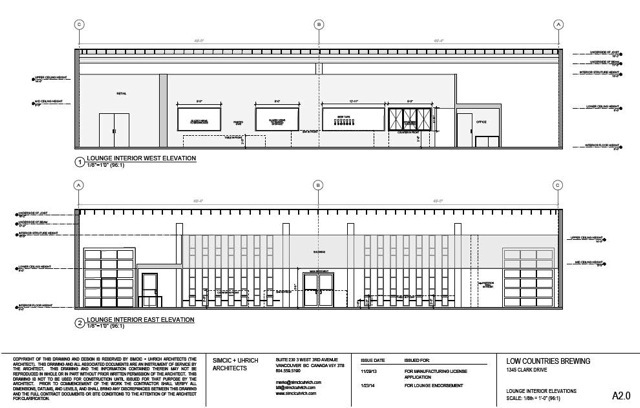 We have allocated a total of $12,500 for permits throughout this process. I have blogged about them a little bit under The Process of Starting a Craft Brewery, subcategory X: Government Stuff. There are lots of permits you need and getting them all in a timely manner is important. To be honest, the process of preparing for permits and approval is one of the keys to getting this process right. In short, for your business to move forward you need to submit for your permits in a timely manner, with information that is well thought out, thorough and correct. Changes or missed steps here will cost you down the road. Read more about permits at the page linked above (and I will add more details in the next week). Anyhow, coming full circle here, our floor plan was a real labour of love. Like any decisions you make with a partner, there is give and take. However, when you add in an architect, mechanical and electrical engineers, a general contractor and your finances, you get a mish-mash of opinion and information. You can never make a decision without effecting every other decision you have made in the past, and every other decision you will make in the future. Keep everything as central as possible. The longer runs you have for any electrical or mechanical, the more cash you will bleed. For us, moving our main electrical panel 10 feet saved us $3,000. So you can see that small changes can make a big difference. Plan for the future, but prioritize getting to day 1. It is important to think a couple of steps ahead here, at least that is what I have heard from other breweries, but don’t lose sight that you need to get to day 1. Look to save money at every step. Ok, maybe you are better at this than I am, but we are in full cash saving mode, and we feel like we have been for a long time. Any chance we can save money on something, we are doing it. Tasting room and Retail area. A huge part of all these breweries starting up in Vancouver is the ability to sell your products from your business. It takes what was once an impossible task, and makes it so much more realistic of an opportunity. 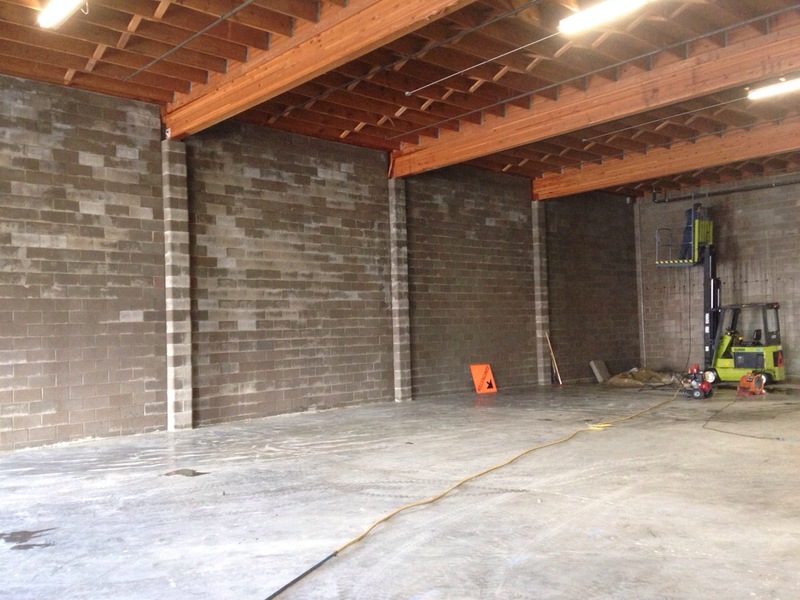 So make sure you design a space that works for your brewery. For us we wanted something intimate, open to the brewery, and simple. Work with sub trades early in the process. You don’t have to pick who you are working with, but bouncing plans off them will give you real world answers to questions you have. It was also help you find savings and efficiencies in your space. Another dilemma on decisions. You can have things done quickly, you can have things done for your budget, and you can have things done inline with your dreams, but at best you will get 2 of these things, but most of the time you will only get 1 of these things. What will you pick? Depending on if you are focusing on production or focusing on tasting room/retail sales, your layout may be different. For us, we are a production brewery first, so the layout and design of the space tried to take this into account as much as possible. Process workflow, material in and material out, future expansion are all important to us, and are reflected in our space. Keep your cooler close to the tasting room. Iain has so much experience with this kind of thing, that he is adamant that these 2 things need to be connected. He talks about the shorter the run of lines, and being able to connect our taps to tanks instead of kegs will save us heaps of time. What really gets us excited about our space is the connection between the tasting room and the brewery. When you are sitting in our tasting room, you will quite literally be 10 feet away from the brewhouse. Want to watch Iain add hops to a brew, just sit back enjoy your beer and watch from your perch. You will also be able to have a first hand view of the barrel storage area, which we think is a really cool thing. We also think the art gallery will add a nice connection to the local community, and we hope the growler and retail area will have good process flow so as to not back-up too much. As I have always said, Iain is really good with this kind of thing, so if you have questions about how to lay your brewery out, feel free to contact us. At the end of the day, follow your instincts on the way things should be. Whether you have experience with this kind of thing or not, make sure you follow what you would want as a consumer. You will deal with enough people along the way that aren’t into craft beer (like contractors, architects, etc) that their opinion will help to balance yours out. Stay positive and you will find the way. This entry was posted in Best Practices, Brewhouse and tagged 33 Acres Brewing, Aaron Jonckheere, Blog, Bomber Brewing, Brassneck Brewing, British Columbia, Cash Is King, coal harbour, Craft beer, East Vancouver, Growler Fills, How to name a brewery, How to Open a Craft Brewery, Iain Hill, New Breweries 2014, Parallel 49 Brewing, Starting A Craft Brewery, Storm Brewing, Strange Fellows Brewing, Tasting Room, VCBW on April 26, 2014 by locuswest. One thing we have long struggled with is the type of packaging we are going to put our finished product in. Speaking with other craft breweries, we are not alone in the uncertainty we face in making this decision. I have summarized the pros and cons of each decision, and I hope at the end of the post, you can give me some feedback on what is the best in your mind. Starting your own brewery is a great thing, but it is important to have a firm sense of what you want, and merge that with the financial and marketplace dynamics you face. In other words, what you started out wanting may not be what you end up with. Really there are 2 choices that you can put beer into. Either cans or bottles. Before I dissect each of the options, here are some general comments. I had long thought that cans were the clear environmental choice, but a few articles haver pointed me back in the direction of uncertainty. Click here to read one article. So with no clear winner on the environmental side, what about taste. I hear anecdotally that people can taste the plastic in cans. Does this mean they don’t pour the beer out of cans into a glass (yikes). Also there is the image. Is the wider market really ready for high quality craft beer in cans? I know Steamworks and Central City have their beer in cans, and by all accounts do very well, but could you imagine a much smaller player, like 33 Acres or Bridge Brewing putting their beer in cans? Would it make a difference at all to your perception of them. Cans: Cans are a good option for a brewery for a variety of reasons, but there are some downsides to them, which I have tried tried to summarize below. Essentially, there are 2 options for can sizes 355ml or 500ml. The smaller can is more North American while the larger can has a much more European feel to it. Bottles: On the other hand, bottles are a great option for a new brewery, as the 650ml bottle is the standard size for craft beer, and is well established in the BC marketplace. Not unlike cans, there are both pros and cons to packaging beer in bottles. So you can see how we are conflicted on the decision that we are going to make. We have flip-flopped back and forth from cans to bottles and we have really wrestled with the decision. What would you do? What would you want us to do? The trouble we now have is that we can no longer waffle on this decision. We need to place our order so that we can get our equipment in time for the launch of our brewery. So vote here, and let me know what you think. I would love to hear from you as well. This entry was posted in Business Side of Things, Packaging and tagged 33 Acres, Barrel Aged Beer, bottle of beer, Brewhouse, British Columbia, can of beer, Canada, East Vancouver, How much does it cost, How to start a Craft Brewery, How to write a beer business plan, Investment into Building a Brewery, Local, new breweries opening in BC, New Craft breweries, Parallel 49 Brewing, Sour Beer, Storm Brewing, tasting room Vancouver, Vancouver on April 10, 2014 by locuswest.